Home / Botanical Art / Just a Note Using Bouquet, Lg. Just a Note Using Bouquet, Lg. “Bouquet, Lg.” is stamped with a black Memories pad vertically and horizontally, colored with markers and cut out. Two additional daisies are stamped, colored and cut out. These cut-outs are assembled on white card that has 1″ cut from the lower front. The cut edge is edged with a gold Krylon leafing pen and the flowers are glued on the card so that two of them overlap the cut edge. A polka dot piece of scrap book paper is glued to the lower part of the inside of the card. 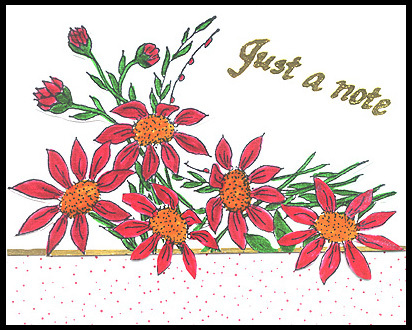 “Just a Note” is stamped and embossed with gold embossing powder on the white card stock. Card by Judy Conklin.